Buying gifts for babies ​aren’t necessarily hard, as there are lots of fun toys for newborns. However, you probably want to get them something unique that they don’t already have, and that’s where the Manhattan Toy Winkel Rattle and Sensory Teether Toy comes in. This top-rated baby toy gets rave reviews from users, who say it’s great for teething and building up dexterity. The Winkel Rattle and Sensory Teether, which is best for babies 0 to 2-years-old, looks a bit perplexing with its maze of tubes, but this special design is what makes it so appealing. The soft cube in the middle makes a gentle rattling sound to keep kids entertained, and the soft, continuous tubes encourage little ones to grasp the toy while providing lots of room for them to bite. The plastic loops are BPA free and easy to wipe down — just don’t put this toy in the dishwasher, or else it may melt. Parents have great things to say about this toy, writing that their young babies love playing with it and that it’s one of the easiest toys for little hands to hold. With more than 3,000 5-star reviews, you can rest assured the Winkel Rattle and Sensory Teether Toy will be the perfect gift for your grandchild. Take a peek at some of the other best unique baby gifts you can buy. Once kids get a little older, they’ll enjoy playing with more complex toys that let them express their creativity, which is why the Mega Bloks 80-Piece Big Building Bag makes a great gift. No toddler’s playroom is complete without a high-quality set of building blocks — put this product on the top of your shopping list! As the name suggests, this Building Bag includes 80 plastic pieces in an array of shapes and colors. Thanks to the blocks’ simple shape and oversized prongs, they’re easy for kids to hold, stack and take apart. 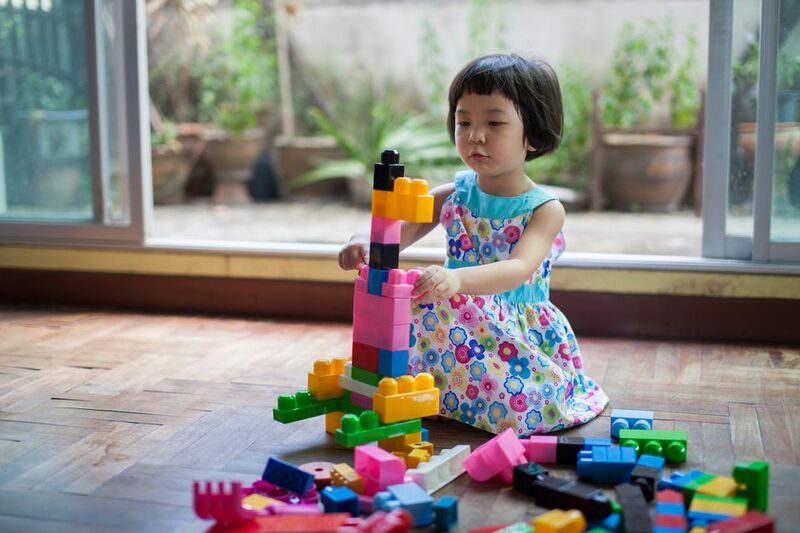 With this toy, your grandkids will be able to build houses, animals and anything else they can imagine, exercising their creativity while developing fine motor and critical thinking skills. This kit is ideal for children 12 months up to 5 years, and thanks to its versatility, kids will enjoy playing with it for several years. The Mega Bloks 80-Piece Big Building Bag has more than 4,000 5-star reviews from happy parents, so you know it’s a high-quality product. Some of the most frequent comments are that these blocks are well-made and easy to use. See more reviews of our favorite toys for toddlers available for purchase. One of the hottest gifts for school-age kids this year are Fingerlings, adorable finger-sized interactive pets. This particular Fingerling is a little blue monkey named Zoe, and she would make an amazing present for a grandchild age 5 or older. Fingerlings will hold onto your finger, and they respond to sound, motion and touch. They know when you’re talking to them or petting them, and they’ll react by blinking their eyes, turning their heads or making cute monkey noises. They will even blow you kisses! Children will love getting to know their little friend and exploring all the different ways to interact with them. Reviewers note that these little pets are incredibly adorable and will keep kids entertained for hours. The various Fingerling styles have different personalities, and they will even interact with each other if you have more than one. Bottom line? You’ll definitely win grandparent of the year if you gift one of these cute toys to your grandchild! While it’s certainly on the more expensive side, Sphero 2.0 makes a wonderful present for kids in the tricky tween years. Sphero is an app-controlled robotic ball that’s popular with older kids thanks to its versatility. Not only can you play games with the ball, but it can also be used as part of augmented reality or programmed with STEM apps. There are a host of different ways to use Sphero. At its most basic, you can drive the ball around using your phone, traveling up to 7 feet per second and navigating obstacle courses with ease. You can also play tabletop games that test your memory and coordination skills. But that’s not all! There are more than 30 apps available to expand Sphero’s gameplay, including augmented reality apps, or you can download special apps that allow you to program the ball, learning computer programming principles, math and science. Reviewers say this app-controlled ball makes a great gift for kids ages 10 and up. The various ways to play keeps things interesting, and the ball itself is incredibly durable — some people even use it to play with their pets! See more reviews of our favorite toys for tweens available for purchase. Kids today are obsessed with their electronics, which is why you can rest assured they’ll love receiving an All-New Fire 7 Kids Edition Tablet as a present. These special kid-friendly tablets from Amazon have all the functionality of a normal tablet, plus additional parental control options to keep kids safe online. The Fire 7 Kids Edition features a 7-inch display, 16 gigabytes of internal storage, and up to 8 hours of mixed-use battery life. It comes with one year of FreeTime Unlimited, which gives kids access to thousands of popular apps and games, videos, books and educational content, meaning they’ll never get bored! What’s great is that the tablet also has a two-year worry-free guarantee, so if your grandkids break it, you can get a replacement with no questions asked. Parents will approve of this gift, since the tablet comes with best-in-class parental controls, allowing them to manage usage limits, content access, and educational goals. Reviewers say these tablets make a great gift for tech-savvy toddlers and younger kids, allowing them to have their very own electronic gadget full of both entertaining and educational content. See more reviews of our favorite electronic toys available for purchase. Want to get your grandchildren a gift that will encourage them to unplug from their electronics? Sequence for Kids is a top-rated kids board game that’s perfect for children ages 4 to 7. This fun board game is a simpler version of the popular Sequence game, and it will teach youngsters basic strategy skills while providing hours of entertainment. Sequence for Kids can be played with 2 to 4 people, and it comes with a folding game board, 42 playing cards, multi-colored playing chips, and instructions. Instead of using traditional playing cards like the normal game, this kid-friendly version has cute images of animals on each card. The premise of the game is to put down a card from your hand, then put a chip on the corresponding spot on the board. The first person to get four chips in a row wins! It’s straightforward enough for even young kids to enjoy, and as they get older, they’ll learn more strategy, such as blocking other players. Reviewers say this game is great because even kids who can’t read yet can play, and you can bet it would make an excellent gift. See more reviews of our favorite board games for kids available for purchase. Who says gifts for grandchildren can’t be fun and educational at the same time? The Scientific Explorer My First Mind Blowing Science Kit gets glowing reviews from buyers who say their kids absolutely adore playing mad scientist. My First Mind Blowing Science Kit is best for children ages 6 and older, and many of the experiments require adult supervision. The 20-piece kit comes with a variety of tools, including cotton swabs, test tubes, measuring scoops, and safe chemicals like citric acid, baking soda, cornstarch and more. With all these ingredients, kids will be able to make their way through 11 fun activities, such as creating an underwater volcano or magic ooze! Several of the projects do require additional supplies, but they’re all things you probably have around the house, such as flour, tape, and pens. Reviewers say this kit is incredibly entertaining and education for school-age kids and it will allow you to spend more time with your grandkids as you experiment together. See more reviews of our favorite educational toys available for purchase.